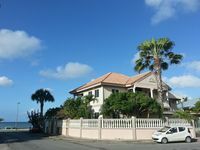 Properties in Oranjestad-West average 4.6 out of 5 stars. BON BINI, you are looking for a quiet little resort with swimming pool. Property 6: BON BINI, you are looking for a quiet little resort with swimming pool. Cozy apartment, just 5 minutes to Nikky Beach & downtown area. Property 8: Cozy apartment, just 5 minutes to Nikky Beach & downtown area. Brand new modern apartment! Walking distance to beach and restaurants. Property 16: Brand new modern apartment! Walking distance to beach and restaurants. Quiet apartment in a quiet neighborhood. Property 18: Quiet apartment in a quiet neighborhood. All you need is the beach and a Studio that's a vacation experience in itself. Property 32: All you need is the beach and a Studio that's a vacation experience in itself. Start the New Year off right at The Divi Village in sunny Aruba! Property 38: Start the New Year off right at The Divi Village in sunny Aruba! 1-Bedroom vacation apartment on Aruba and few minutes away from eag;le beach! Property 39: 1-Bedroom vacation apartment on Aruba and few minutes away from eag;le beach! Villa Dawn at Divi Beach, one block in from the hotel zone! Property 40: Villa Dawn at Divi Beach, one block in from the hotel zone! Studio with pool view a few minutes from Eagle Beach in Aruba! Property 41: Studio with pool view a few minutes from Eagle Beach in Aruba! A Total Of 7 Fully Renovated Accommodations In One Complex. Property 46: A Total Of 7 Fully Renovated Accommodations In One Complex. Villa Cassillia. The perfect place to relax in Aruba! Property 48: Villa Cassillia. The perfect place to relax in Aruba! Property 49: A Total Of 7 Fully Renovated Accommodations In One Complex. Great central location, able to hit all the beaches. Fred was helpful with anything you needed. Perfect suite for two.